It’s almost impossible to believe, but 10-year-old cutting horse sire Metallic Cat has just passed the $3 million mark in offspring earnings in an astonishingly short time of nine months. In June of last year, his offspring collectively earned $1 million in the cutting pen. Then, six months later, at the conclusion of the 2014 NCHA Futurity, his offspring totals jumped to $2 million. And 90 days later, his progeny reached the $3 million mark, officially at $3,092,113. All three milestones were NCHA records, making Metallic Cat the fastest sire to do so in NCHA history. Metallic Cat was also the talk of the 2014 NCHA Futurity. He had 45 money earners out of 80 offspring entered in the event, giving him an average of $14,682. Metallic Cat also led the list of most offspring entered in the Futurity, which was only his second foal crop. Metallic Cat jumped to the top of the 2014 NCHA Futurity sire list when his 3-year-old offspring posted total earnings of $660,690. He led other sires High Brow Cat, Dual Rey and Smooth As A Cat, which came in second, third and fourth, respectively. The impressive red roan stallion, sired by High Brow Cat and out of Chers Shadow by Peptoboonsmal, is owned by Alvin and Becky Fults of Amarillo, Texas. He was trained and shown by Beau Galyean to the 2008 NCHA Futurity Open title and currently is NCHA’s second highest money earning stallion, with $637,771 to his name. Entered in 12 events during his show career, he made the finals all 12 times and never lost a cow. He was retired to stud at the end of his 4-year-old year. He was also the 2009 NCHA Horse of the Year and is in the NCHA Hall of Fame. Metallic Cat got a huge vote of confidence with another record at the NCHA Futurity. One of his 2-year-olds, an eye-catching chestnut colt by the name of Eight Mile, topped the sale at $400,000, while another, Moses Man, a sorrel colt, was third highest seller at $210,000. Metallic Cat’s ability to sire money earners is not limited to cutting. In 2014, he had the top sire average for 3-year-olds in all divisions in the National Reined Cow Horse Association. He was also the top sire average in the category of all ages, all divisions of the NRCHA. 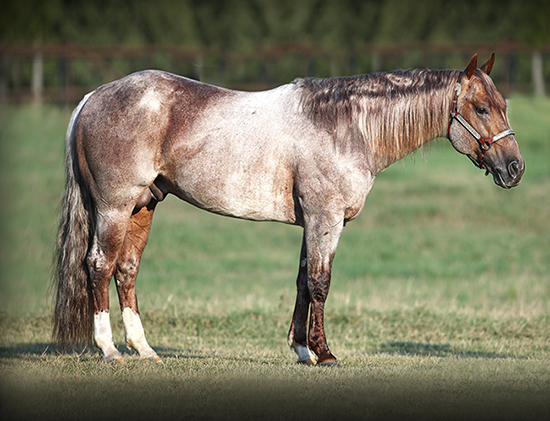 What’s more, Metallic Cat was the top sire of the NRCHA Futurity sale with an average of $50,100. The story of the Fults’ coming to own Metallic Cat is nearly as amazing as his show and sire records. Alvin didn’t buy him until August of his 3-year-old year. That was just three months before he first walked to the herd at the NCHA Futurity. At the time he was owned by Beau and Ashley Galyean, Alvin’s resident trainer, who had purchased him as a started 2-year-old, and worked him for a year on the Fults’ place in the Panhandle. Beau used his truck as collateral to buy the up and coming stallion in the beginning and when the majority of the money came due, he sold the horse to Alvin to cover the note. When Metallic Cat qualified for the semi’s, Alvin withdrew from Non Pro competition. The stallion went on to electrify the crowd with a winning run of 222. “The louder the crowd got, the lower the horse went,” Alvin said. Today, Metallic Cat enjoys the life of a well cared for stallion. He’s quietly ridden three days a week around the ranch with a loose rein and no spurs. When not in his stall, Metallic Cat enjoys a large turnout with full view of several mares. Typical of a young stallion, he calls out and prances and generally draws attention to himself, the way Alvin wants it to be.